At around 10:30 p.m. yesterday I wrapped up my viewing of the Oscars. I bidded my family and the downstairs television adeiu, climbed upstairs, prepared for bed, and then sat in bed for another hour until Billy Crystal wished the audience a good night. Yes, if I truly wanted to end my watching of the show I could have easily not turned on the television in my bedroom, but I cite this otherwise useless mention of the movements of my previous evening to prove a point. The Oscars, even without having anything invested in them, is intriguing and entertaining – enough to make you watch (even with an early-morning train in the morning). I was happy to see The Artist pick up most of the large awards (including the Best Picture award), because this ode to pre-sound flicks demonstrated a good-hearted nature and an ode to film itself (which is what the Oscars represent). The Artist also won for Best Original Score and Ludovic Bource, the composer of the film’s music, definitely deserved the award. On Friday I predicted the winner of the Best Original Song category and, while there were only two choices (so I had a decent chance of picking the winner), I accurately picked “Man or Muppet” as the winner. And while I am happy for Kermit and Miss Piggy, I am most happy for this guy. 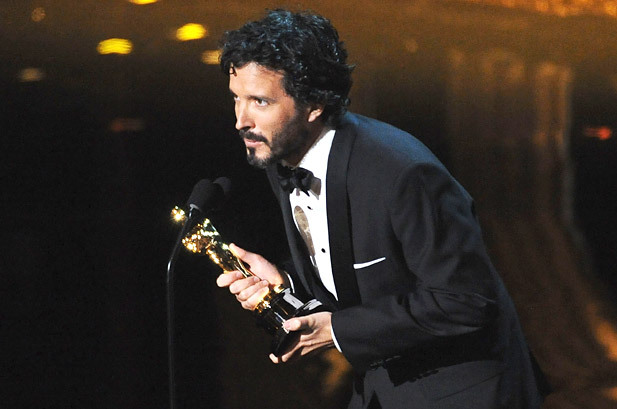 As you can probably tell from the suit and the Oscar, Bret McKenzie won something last night. He was tasked to write music for the 2012 Muppets movie, and, as musical supervisor, he penned “Man or Muppet” and another four songs for the soundtrack. So why I am happy for Mr. McKenzie, besides the fact that we are both human and he achieved a feat of accomplishment. Bret McKenzie was one-half of “Formerly New Zealand’s fourth most popular guitar-based digi-bongo acapella-rap-funk-comedy folk duo,” The Flight of the Conchords. The other half was Jemaine Clement. My friends and I first listened to Flight of the Conchords’ unique brand of folk/comedy when we were in High School. Their purposefully awkward interplay, catchy riffs, hilarious one liners, and surprisingly good voices, had us repeatedly watching Youtube videos of their performances. And while watching those videos I just knew that one of the duo would win an Oscar for a song about muppets. Just knew it. To celebrate Mr. McKenzie’s Oscar victory here is a song about business time. I’m sure he was wearing his business socks! Though ”What a Wonderful World” has been covered more times than I appreciate, especially in remembrance type of themes, I did admire this version because they still provided something, dare I say it, new. The presentation with a white screen was also tastefully done. Yeah. I loved the simplicity. I’m always a fan of a candid presentation.